Embracing the dissertation: Is it possible? Finally: I have a teeny bit of momentum, a daily writing habit, an approved proposal, and a plan to collect data in the fall. Though many obstacles must still be overcome, I have hope I will eventually finish my degree. This newfound optimism has prompted a wave of introspection. It’s funny, and also sad, how we humans so often don’t appreciate something until we either have lost it, or realize we might lose it soon. This is the only chance in my whole life to write a dissertation, and the experience will soon be over, never to be seen again. Writing a dissertation is an amazing privilege, really—what a shame for me not to see it that way. I am now thinking, “I get to write a dissertation” instead of “I have to write a dissertation”. It is amazing how one little word can change the entire meaning of a sentence. I know my God has appointed me to a certain number of days on this earth. How many of them have I wasted by my “I have to write a dissertation” attitude? I enrolled in this Ph.D. program in 2004, nearly eight years ago. How much life have I missed out on since then? How many memorable experiences and outings with friends have I refused because I knew I should be working on my paper? Sometimes, I actually worked on it. Other times, I whittled away the time some other way, neither progressing on my research nor enjoying the fellowship/excursion/event. How much have I allowed guilt and stress to sap the joy from a job I love? How many relationships have languished because my eyes were turned inward? Nearly everyone I know who has completed a dissertation tells me I just need to buckle down and get through it somehow…that it will all be worth it in the end. Then, when you finish, you can get your life back. A colleague shared this wise advice, “Your dissertation doesn’t have to be good—it just has to be done”. The door hanger sign given to me by our graduate school writing support service says, “a page a day keeps the stress away”. The daily writing habit is supposed to keep me from feeling guilty, and it does. But am I wrong to expect more? Surely there should be more to this than just the absence of guilt! I am a realist. I know some aspects of the dissertation will be tedious, maybe even unpleasant. I’ve read the writing books. They all say I shouldn’t wait for writing inspiration to strike—I need to write even when I don’t feel like writing. I don’t disagree with this, and I am in fact living proof of the transformational power of daily writing. Yet I am not satisfied with merely trudging along, doing my writing duty, knowing this will eventually result in a finished dissertation and maybe even a publication or two. Is it conceivable that, if I would just get my attitude right, that this process, at least most of it, could be a pleasure? Is it possible that if I feed the writing muse in just the right way, writing could be a delight more often than not? Am I out of my mind to think I could enjoy writing my dissertation? Embrace it? Revel in it? That I would wish to slow down the rapidly-flipping calendar pages, not because I am worried about getting my approvals done in time, but because I want to savor every moment of a once-in-a-lifetime experience? Perhaps my guilt and cynicism will return tomorrow. Yet for now I am looking ahead with eager anticipation. I feel that same nervous knot in my stomach I get whenever I’m about to undertake something big, at which I might fail. Though a bit anxious about what the future holds, I can’t wait to see what’s around the next corner. It just might be something better than I ever imagined. 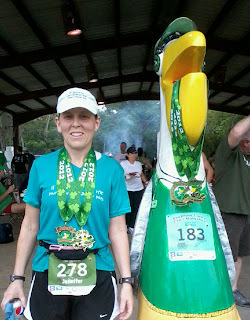 No, not a marathon….but I raced 26.2 miles this weekend! A good weekend of running is a dangerous thing…it can prompt you to do really stupid things. In my case, the problem occurred nearly two months ago, when I ran 7 and 8 miles on consecutive days, and actually enjoyed it. That night, I registered for the Seabrook Lucky Trails Pelican Challenge: two half-marathons in two days on St. Patrick’s Day weekend. My running has been very inconsistent lately, and I knew I was unprepared. 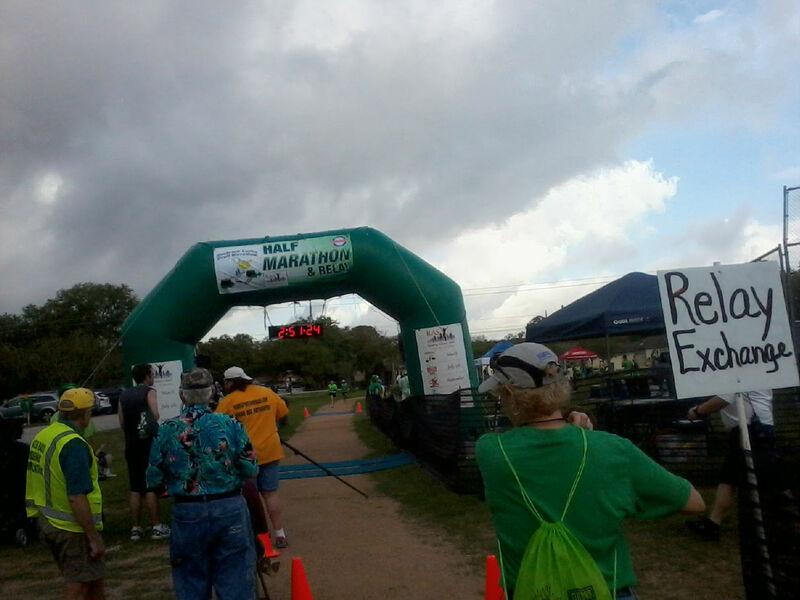 Two weeks ago, I set a 3+ minute PR at the Woodlands half-marathon, in perfect running conditions. I pushed myself further into the pain cave than ever before, and was very pleased with my race. Since then, I have run twice: a 4-miler in which I bonked and walked a bunch, and a 10-mile treadmill run. 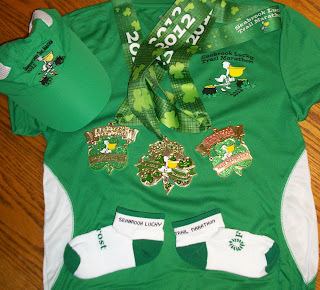 I had no aspirations of speed records this weekend, but planned to approach it as a fun run and a long training run, hopefully just right for my last scheduled half-marathon of the season, Angie’s Half-Crazy Half-Marathon on April Fool’s Day. I decided to splurge on a motel room and make this a running/writing retreat weekend. Unfortunately, the running and its aftereffects took a toll on the dissertation writing. Oh well, it was worth it…what a fun set of races! Saturday had a half-marathon and a half-marathon relay, and Sunday had a marathon, a half, and a marathon relay. 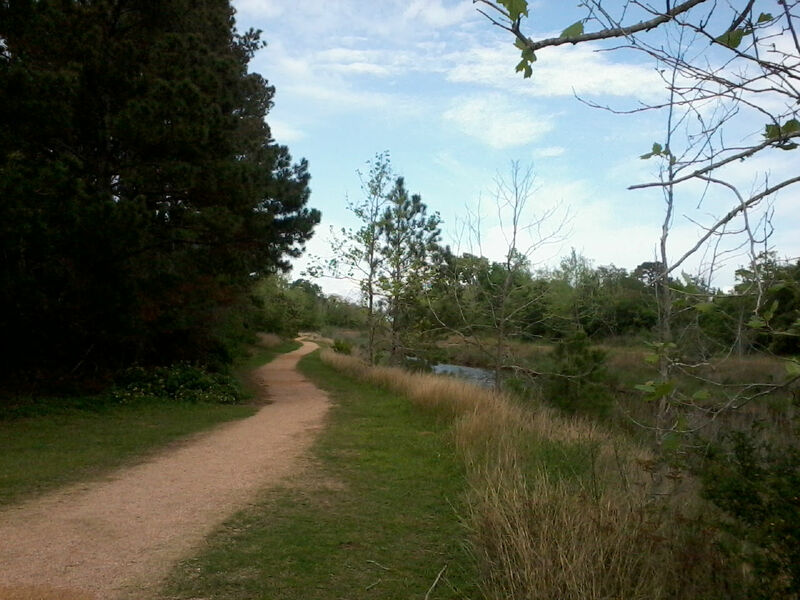 The race course was a 6.55-mile loop along Seabrook’s crushed granite trails, some next to roads, and some through parks and along bayous. 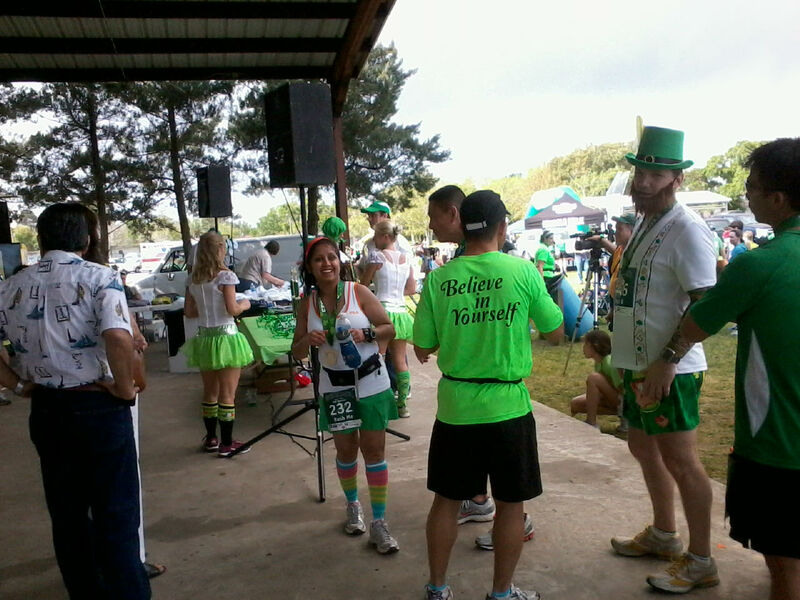 Marathoners ran 4 laps, half-ers ran 2 laps, and relay-ers ran one lap each. 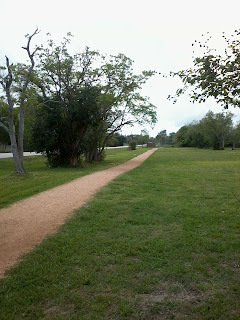 Most of the route had runners going both ways on narrow trails, so even the speedy folks were probably slower than usual. The usual zoned-out loneliness of a half-marathon’s middle miles was nowhere to be found at Seabrook. With multiple laps and multiple races, runners of all speeds were mixed together, coming and going, passing and being passed. The St. Patrick’s Day costumes and trivia questions on signs added to the fun. I pushed it more than I expected the first day, and surprised myself by getting steadily faster as the race progressed. The day started hot and muggy, and the sun came out for the second loop—an occasional coastal breeze came through, but it wasn’t enough. My legs were fried and the rest of me was completely miserable by the time I finished. I think I held back a little bit, knowing I had to do it again the next day, but I felt nearly as awful as I had two weeks before, after running 8 minutes faster. On Saturday, as I found my pace steadily improving, I temporarily entertained an ambition of negative-splitting both races, and the whole weekend (by doing the second race faster than the first). This lasted until Mile 2 of Sunday’s race, when my dead legs told me I would have to be satisfied with slow-jogging the whole way. I did manage this, just barely. Sunday I finished nearly an hour behind the overall female winner, an 11-year-old girl, who had a time around 1:40. When I saw her on the course, she was speeding along and zipping around people—the narrow trails didn’t seem to slow her down much. I should have asked her to autograph my bib, in case she turns out to be an Olympic superstar someday. The post-race party was the best: fresh-grilled hamburgers, hot dogs, with all the fixings; also soft drinks, tacos, burritos, ice cream, cookies, red beans and rice, green beer, and probably more stuff I didn’t notice. Start line, finish line, and party were in a big park, with plenty of open green space and a nice pavilion. 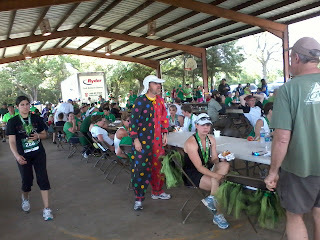 There were zillions of smiling volunteers, all through the course and at the pre- and post-race festivities. Pictures of races don’t always add much, but in this case I think they capture the atmosphere. I was disappointed in the pelican statue picture, because the nameplate “Robby” got cut off at the bottom. 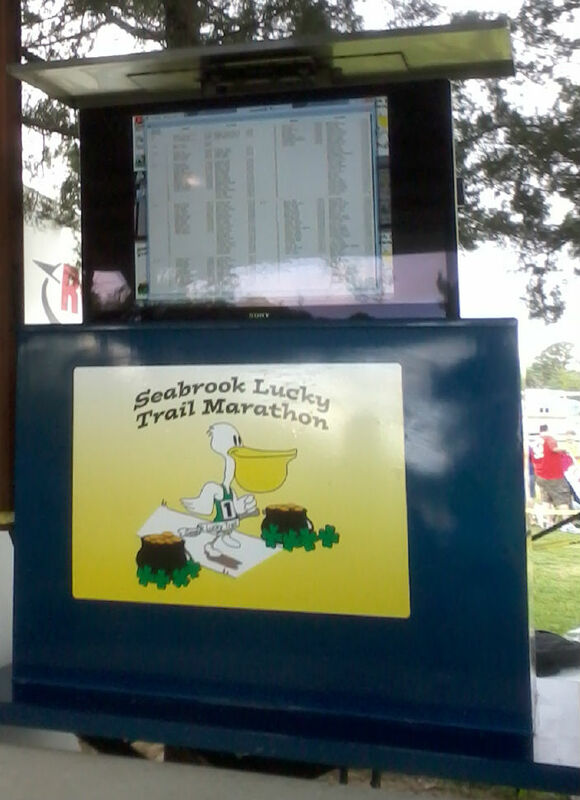 Robby Sabban, race director extraordinaire, was responsible for this weekend’s fun. If you are ever in the Galveston Bay area and have the opportunity to do a Robby Sabban race, you should—you can count on it being an extremely well-organized and runner-friendly event. The Pelican Challenge medal (bonus for doing both HM’s) has this stamped on the back: “Two halves take FULL effort”. Unexpected consequences of working on a Ph.D. The floors are unvacuumed, the tables a mess. In hopes Yule cheer will dispel dissertation despair. 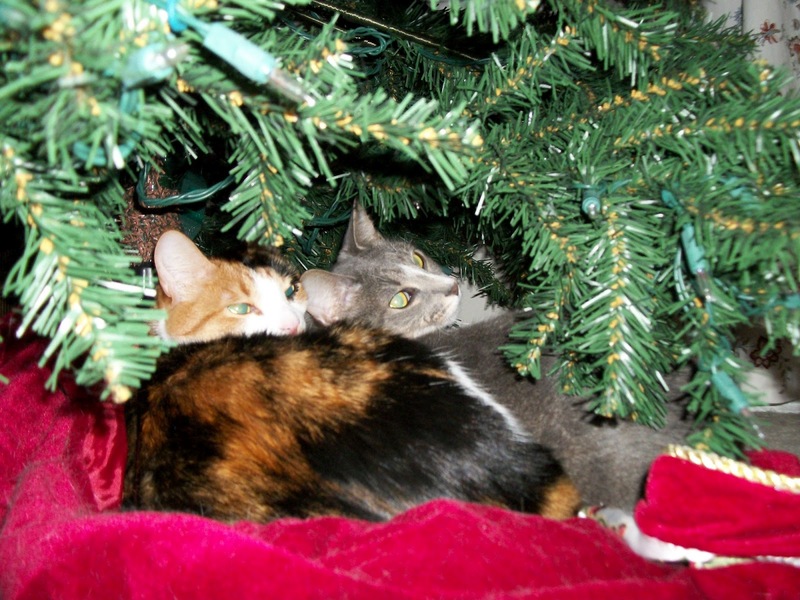 Instead they are climbing the Christmas tree. Its branches hiding two feline heads. Intent on her shiny ornament goal. The cat house third floor a perfect launch pad. It refuses to yield and continues to stand. Far from the tree, away in the hall. Since then we have found so many more. Its decorations removed by two kitties so sweet. Before more special ornaments are met by foul play. The data will be collected and the findings cohered. Do not with the norm yourself compare. "Happy Dissertation to all, and to all a good-night!" The culprits (Calico = Zoe, Gray = Chloe). Don't they look sweet & innocent? Everyone should occasionally re-evaluate their goals. You just never know, you may decide the original goal is (a) impossible, (b) no longer worthy of pursuit, or (c) insufficiently lofty (unlikely, at least for some of us). It is generally agreed that specific, measurable goals are good, and that vague, unmeasurable goals are not so good. I have a new dissertation-related goal: I am determined to graduate before Texas A&M builds any new buildings. (Finishing a building currently under construction doesn’t count). This goal is specific, measurable, and at least partly under my control. Based on my current coordinates on the dissertation continuum, accomplishing this goal seems possible. Of course, it is also possible that A&M could fast-track a building and throw it up in a year, in which case the goal is hopeless. Why on earth would I choose such a goal? I’ve considered it a couple of times, whenever a favorite parking lot was erased, replaced by a beautiful new building. Someday I need to research exactly how many brand-new buildings were constructed, from drawing board to completion, while I was writing my dissertation. I can think of at least four without even looking at a map. At least one is currently under construction—probably more. The impetus for turning this vague observation about new buildings into a concrete goal occurred last Thursday. After leaving my writing class early, I embarked on an advisor-ambushing mission. Timing was critical. My destination was the familiar Blocker building in which I’d completed two courses and met my advisor many times. Unfortunately, I approached the building from an unfamiliar heading, because my starting point was Kyle Field instead of Parking Lot 50. I found myself standing on a busy sidewalk, shading my eyes and scanning the skyline in all directions, trying to figure out which building was the one I wanted. I knew a new building had been constructed on the parking lot next to Blocker, but I couldn’t figure out which building it was! All the buildings looked unfamiliar, and at least two looked brand-new. I was certain I was in the right neighborhood, but was clueless as to whether I should bear left or bear right. As I looked at my watch, I felt a twinge of panic….if I didn’t get there in time, my advisor would finish his class, leave his classroom, and wander off into the Blue. In desperation, I swallowed my pride and asked the nearest student how to find the Blocker building. I was so grateful to the young gentleman, who removed his headphones and kindly pointed me in the correct direction. I discovered I had overshot the building, wasting precious minutes by walking too far to the east. I doubled back, and soon could see my building, dwarfed by its newly built neighbor. Fortunately, I arrived in time, met my advisor, and all was well. If I had tried to find the building on my own, without help, I undoubtedly would have wandered in a fog for at least ten minutes, and my mission would have failed. 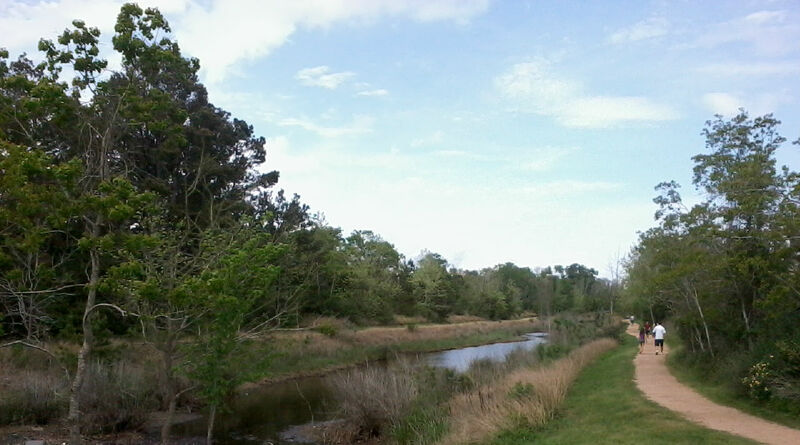 The next day, I set off for Blocker again (the previous day’s quest had been to set up a reading meeting with advisor). Once again, though starting off from familiar Lot 50, my complete confusion with all the new buildings caused me to overshoot my destination. This time, I noticed the mistake myself, without outside help, and changed course before I had gone very far out of the way. Feeling like a complete idiot, I resolved to finish my dissertation before more new buildings caused me to completely lose my grip on reality.